Does your internet service provider (ISP) live up to their end of the bargain regarding their advertised speeds, or do they fall short? Just because your ISP claims to deliver certain speeds doesn’t mean your connection is actually that fast. If you want to find out whether you’re getting your money’s worth on your internet service, you can run an internet speed test to check your download and upload speeds. 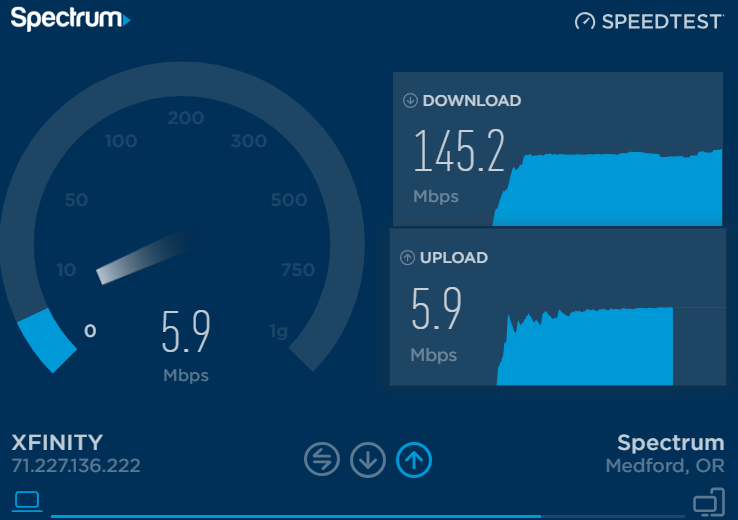 Spectrum is a popular option for speed tests, but is their application reliable, or should you use a competitor’s test? Let’s find out! We took several steps to ensure the reliability of the testing environment, which allows us to rule out the possibility of test results being tainted on our end in any way. 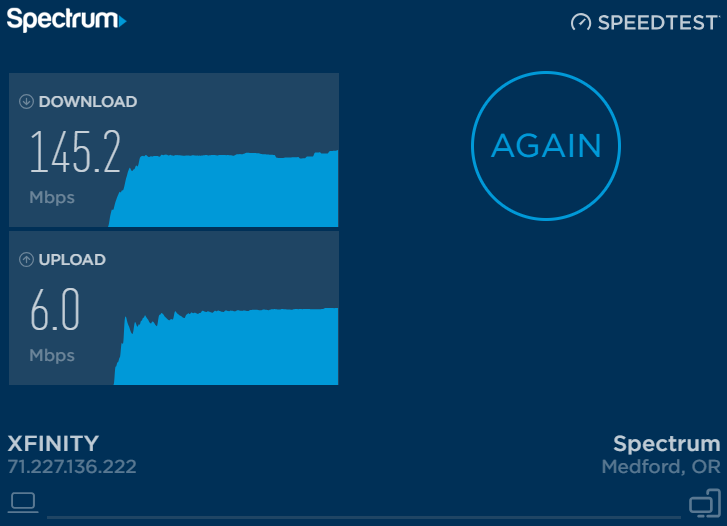 We ran the Spectrum speed test five times on the same connection, using a desktop computer, a laptop, and a smartphone. We closed all active programs other than the Google Chrome browser used to run the tests, and we disabled any Chrome plugins. With this repeatable testing environment in place, we ran our Spectrum speed tests, and received the following results. For these tests, we used a connection that advertises download speeds of up to 150 Mbps, and competing speed tests confirmed that we were indeed receiving speeds at or exceeding the advertised rates. The Spectrum speed test also produced results in this range, and we were impressed with the general reliability and consistency. Getting down to the specifics, the Spectrum speed test took an average of 5.3 seconds to load and 35.5 seconds to run, which are typical times compared to most competitors. However, one fairly major gripe we have with this test is the fact that it does not record ping or latency times. Considering that the vast majority of internet speed tests do analyze ping times, this was a disappointing discovery. 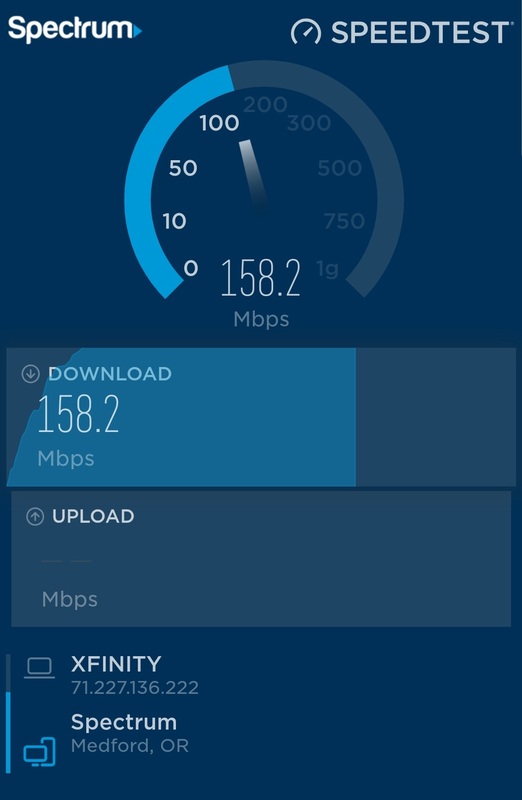 The average download speed registered at 149.0 Mbps, while the upload speeds were all recorded at the exact same speed of 6.0 Mbps. These speeds were right in line with our expectations, and the results were pretty steady from test to test, so we believe the Spectrum test to be quite accurate. If you would like to take a look at how this test looks on both the desktop and mobile versions of the Spectrum website, check out the screenshots we took during and after testing. To begin with, we were pleased to see how consistent the results were for the Spectrum speed test. The download speeds and upload speeds were exactly what we expected to see from this test, which is obviously the most important factor to consider. We also appreciate how Spectrum provides information regarding the internet service provider and IP address of the test origin site, as well as the city where the testing location is based. The Spectrum speed test also has smooth modern graphic design, and there’s no ads cluttering the screen. Finally, this test runs on a secure https protocol, which is a welcome sight compared to many competitors who run their tests on insecure websites. The biggest issue with this speed test is the fact that it doesn’t display ping times. Considering that nearly every competing speed test does record pings, this is a really unfortunate oversight. 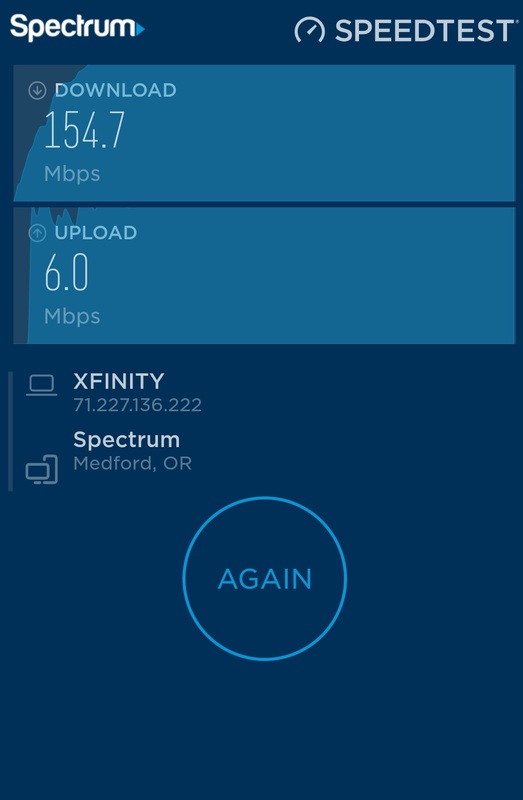 Spectrum also doesn’t include many advanced features ― you can’t store test results, and there’s no information about troubleshooting or improving connection speeds either. The Spectrum speed test is reliable and trustworthy when it comes to testing download and upload speeds, which is by far the most important aspect of any internet speed test. It also has a nicely designed interface, and we like the fact that Spectrum operates their speed test on a secure website. While it is certainly a head-scratcher that they don’t include any information about ping or latency times, and there aren’t really any advanced features to speak of, overall there are more pros than cons with the Spectrum speed test. It’s not the best internet speed test in the industry, but it’s still a strong offering that we generally recommend.